Quantum dots (QDs) are nanoscale crystals of semiconductor material that exhibit excellent optoelectronic properties such as tunable emission wavelength, narrow emission spectrum, and high photoluminescence yields. First discovered in the 1980s, these materials have been the focus of intense research because of their potential to provide significant advantages in a wide variety of optical applications, among them light-emitting diodes (LEDs). Quantum dots are expected to deliver lower cost, higher energy efficiency and greater wavelength control for a wide range of products, including lamps, displays and photovoltaics. Ever since the first cadmium selenide (CdSe) QD-based light-emitting devices (QLEDs) were reported in 1994, the dominant materials for QLEDs investigated since then have been limited to wurtzite or zinc blende Cd-based QDs. Similarly, the best developed and studied colloidal QD lasers have been fabricated from Cd-based semiconductors. Now, researchers have presented a new family of photoelectric materials for light-emitting devices: colloidal all-inorganic perovskite cesium lead halide QDs. This new material could find applications in LEDs and lasers, and has an especially big potential in high-performance displays, lighting, monochromatic narrow-band photodetectors, and optical communications. "We discovered that our newly engineered quantum dots possess superior optical gain properties, representing a new class of solution processed, low-threshold, truly stable and wavelength-tunable gain materials," Professor Haibo Zeng, Director of the Institute of Optoelectronics & Nanomaterials at Nanjing University of Science and Technology, tells Nanowerk. "The solution process ability of these QDs also makes them applicable for device fabrication from simple and cost-effective printing and spraying technologies." Zeng and his team have reported their findings in two recent papers in Advanced Materials: "Quantum Dot Light-Emitting Diodes Based on Inorganic Perovskite Cesium Lead Halides (CsPbX3)" and "All-Inorganic Colloidal Perovskite Quantum Dots: A New Class of Lasing Materials with Favorable Characteristics". The later work has been almost simultaneously reported with a paper by Maksym V. Kovalenko’s group at ETH Zurich on the same topic ("Low-threshold amplified spontaneous emission and lasing from colloidal nanocrystals of caesium lead halide perovskites"). The current research in Zeng's group focuses on novel light-emitting materials, in particular high stable nanomaterials for displays and lighting applications. In the past two years, halide perovskite materials have been demonstrated to be intriguing semiconductors with outstanding high performance for solar cells. Zeng and his team is convinced that these materials also have a huge potential for LEDs and lasers. "When the CsPbX3 perovskite QDs with tunable emission wavelength, narrow emission spectrum, and high luminescent efficiency were reported, we started to study various applications of these QDs – light-emitting devices, laser, and photodetectors," Zeng notes. According to the team's new findings, all-inorganic colloidal perovskite cesium lead halide quantum dots have several merits, such as luminescence wavelength tuned by both the size and the halide composite (Cl, Br, and I), high photoluminescence quantum yields and high ink stability. Furthermore, this new QD material is easily prepared via a typical synthesis method by hot-injecting cesium stearate into PbBr2 solution at 170°C. The involved ionic metathesis reaction takes only several seconds because the nucleation and growth kinetics are very fast, which is obviously beneficial for future industrial production. 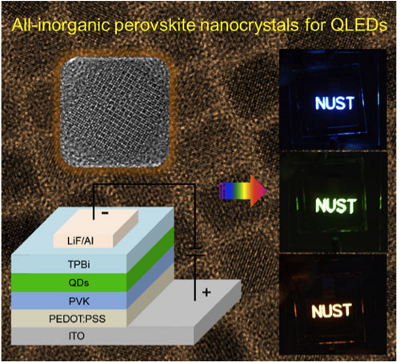 Secondly, It is the first time to report the QLEDs based on all-inorganic perovskite cesium lead halide nanocrystals, which present a new photoelectric material for light-emitting devices. Going forward, the researchers plan to study various aspects of the new material, such as the stabilities of CsPbX3, the device performance, and the QD backlight displays. "Our plans for the next stages of our investigation are to further increase the stability of cesium lead halide material and improve the performance of the QLED devices, as well as the displays process by backlight techniques," says Zeng. One particular issue is that, compared to organic-inorganic halide perovskites, the all-inorganic CsPbX3 perovskites have higher stability but they are still sensitive to water and air. The team is confident this can be solved by surface passivation or polymer/QDs composite microspheres in order to fabricate high-performance and practical display devices. As witnessed by the above-mentioned research reports, the unique size, composition-dependent photoluminescence properties, and high photoluminescence yields of CsPbX3 QDs have motivated increasingly active research into their use in next-generation display technologies. If the remaining fabrication issues can be resolved, it can be expected that all-inorganic perovskite cesium lead halide will be widely used in numerous fields such as photoluminescence, electroluminescence, monochromatic narrowband photodetectors, bioimaging, visible optical communication fields, solar cells, lasers, and displays.